Frontier Fire now uses ScanSeries, made by BuildingReports, to test and inspect fire alarm and sprinkler systems! BuildingReports is the most trusted inspection solution in the industry, and the leader in web-based inspection reporting! ScanSeries is an all-in-one system that ensures our inspectors are prepared and properly document everything during a fire alarm and sprinkler inspection service. 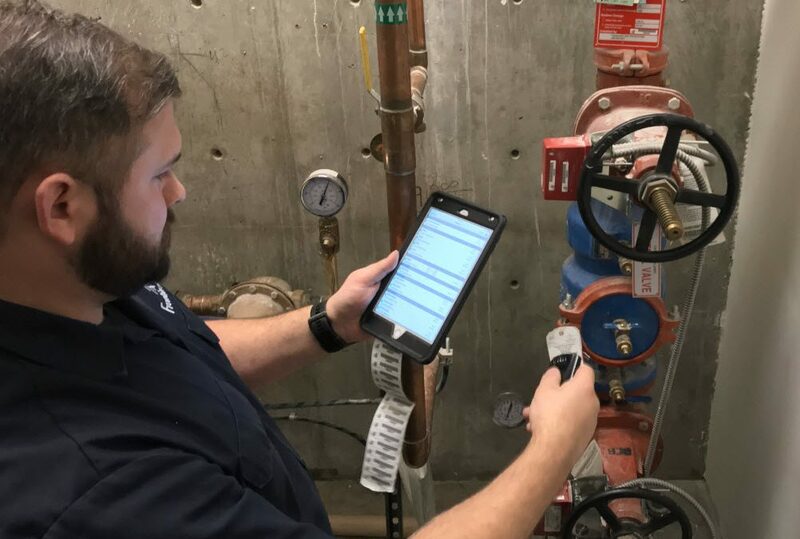 It helps us generate and receive reports online, send and approve repairs, follow industry standards and NFPA codes, track the progress of a technician during an inspection, and ensures that every device is properly inspected! Because BuildingReports is fully committed to making the most trusted fire and life safety inspection tools in the world, Frontier Fire is happy to announce our use of their features. The ExtinguisherScan feature gives inspectors the ability to create in-depth inspection reports for portable fire extinguishers, as well as lighting and personal protective equipment. It also helps inspectors manage and track the maintenance of future extinguishers that are moved off-site for repairs. The FireScan application is used for data collection. The data is collected during a fire inspection for control equipment, auxiliary functions, initiating devices, monitoring equipment, and notification appliances. Then the data can be easily reviewed and shared. The SecurityScan offers an efficient way to collect precise and in-depth data. This data can be collected during an inspection to help with systems used for security, access control, CCTV, and nurse call stations. The SpinrklerScan assists inspectors so they can test and collect data for both water-based fire protection equipment and sprinkler systems. This also helps them to create a graph of the pump flow measurements. The SuppressionScan helps inspectors scan and record valuable data used for critical hazards. It can be used in any type of building to collect data for gas detection, kitchen hood systems, and more. The ScanSeries platform has many beneficial features that help Frontier Fire continue to serve as the leader in fire inspection and protection services throughout the Denver Metro Area and Colorado Western Slope. Through verifiable results, convenient access, intelligent reporting, and reliable security, ScanSeries is the total inspection solution. The system is innovative, user friendly, offers instant inspection reports, guarantees all data is secure, and there are many cost-effective features to choose from. Armed with this technology, Frontier Fire can ensure our customers that we are even more prepared to assist you with all of your fire alarm and fire sprinkler needs.